The Leathwaite Community (LWC) serves to underpin our growth to sustain and develop a positive culture in the workplace. It will encourage, inspire and engage all of our people, globally, to achieve common goals. 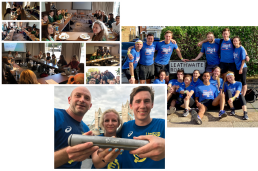 The LWC is open to all employees to join and members will have the opportunity to pursue projects that they are passionate about and take part in some fantastic team-building events, all whilst giving back and being involved in the continuous success of Leathwaite’s CSR initiative.